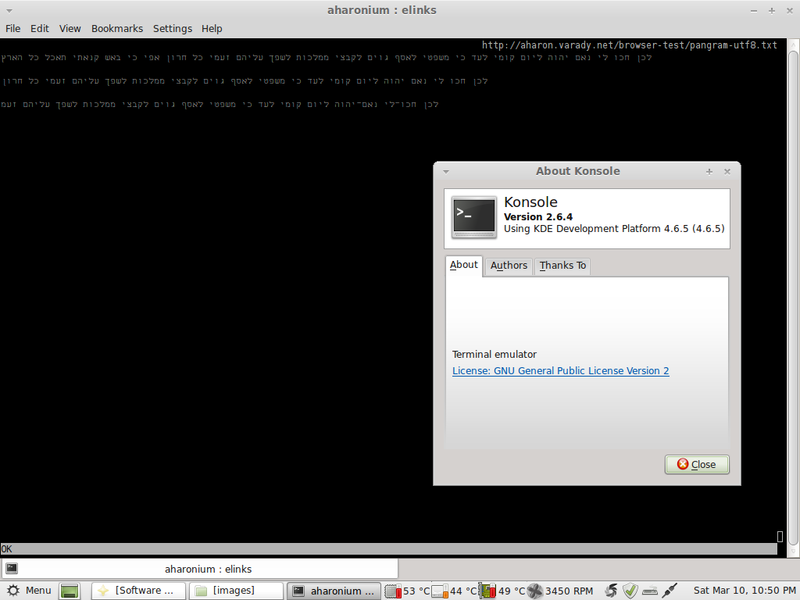 GNU/Linux Konqueror 4.6.5 KHTML 4.6.5 PASS PASS PASS LOUD PASS FAIL n/a 6 Appears not to support SVG files. 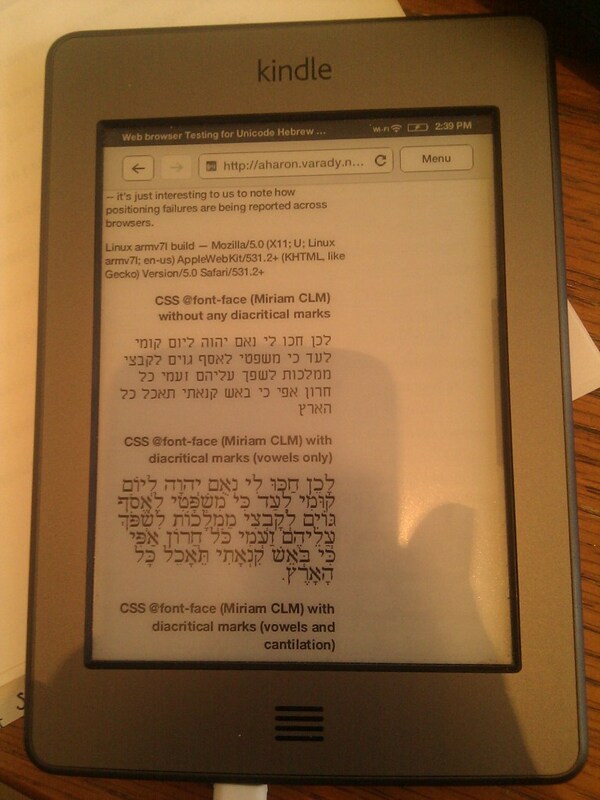 Kindle Touch Silk WebKit 531.2+ PASS PASS FAIL n/a PASS PASS FAIL 5.5 partial @font-face fail with Miriam CLM when niqqud invoked. 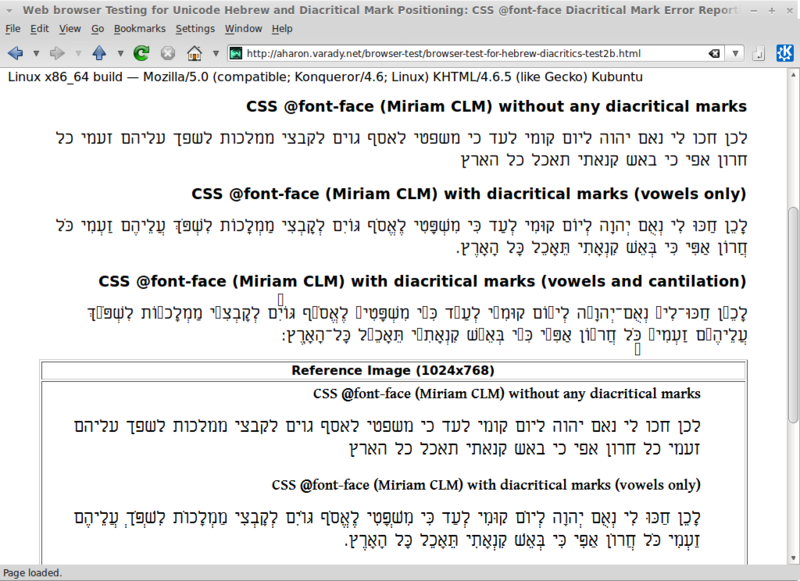 Current GUI-based browsers are almost all doing well supporting CSS @font-face and correct diacritical mark positioning. 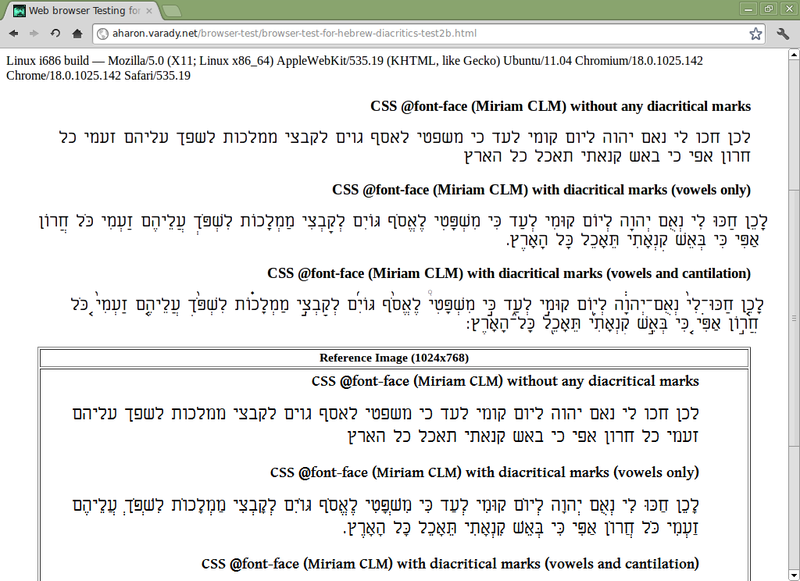 Firefox Mobile 10+ is the only browser currently passing the diacritical test on Android. 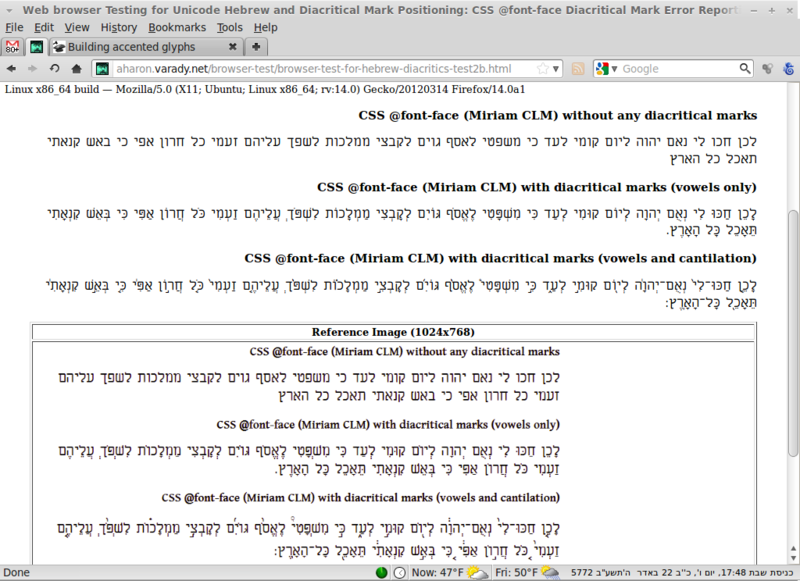 Diacritical positioning errors remain an issue for Opera on all platforms except Windows. 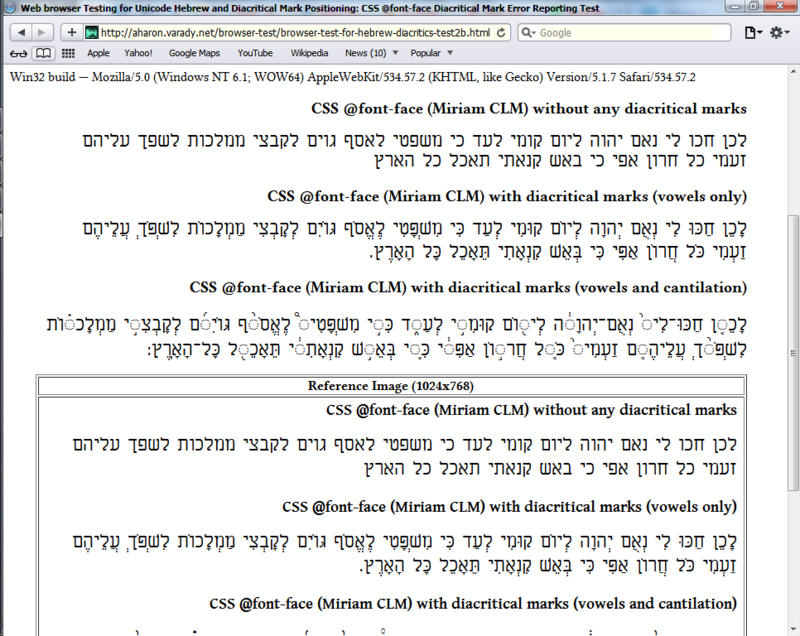 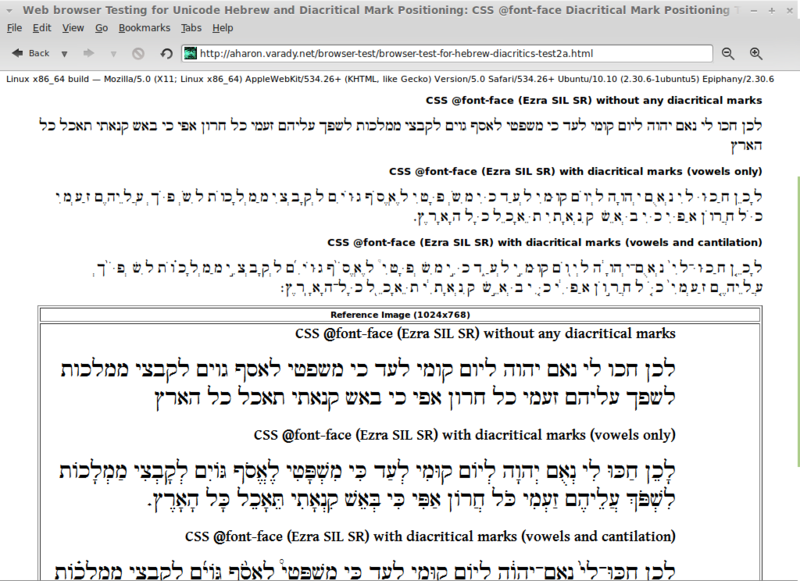 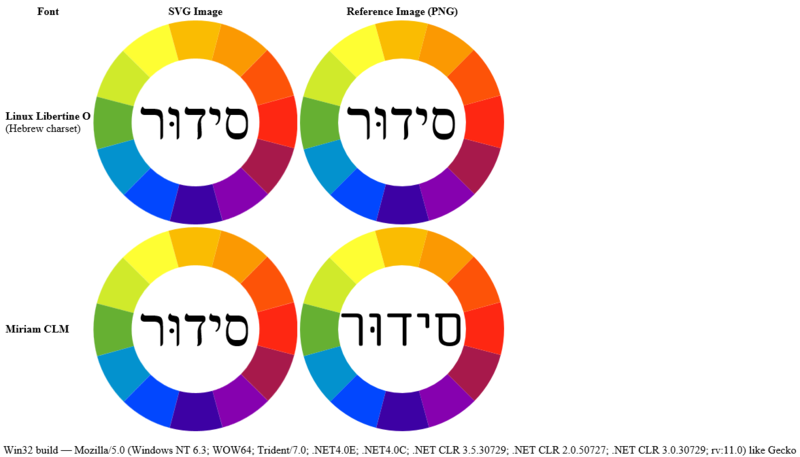 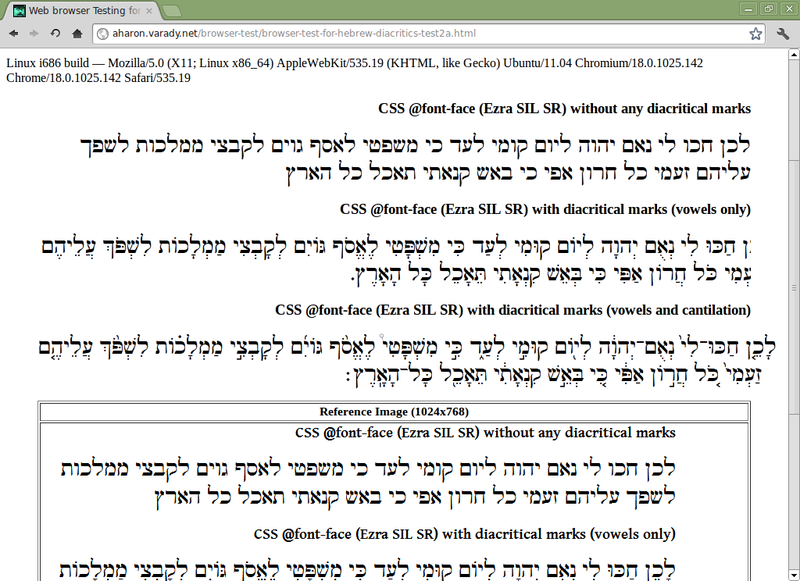 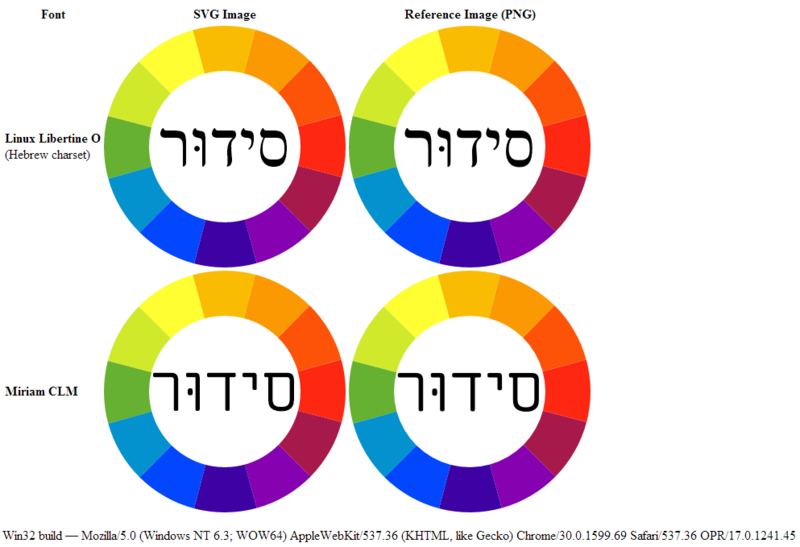 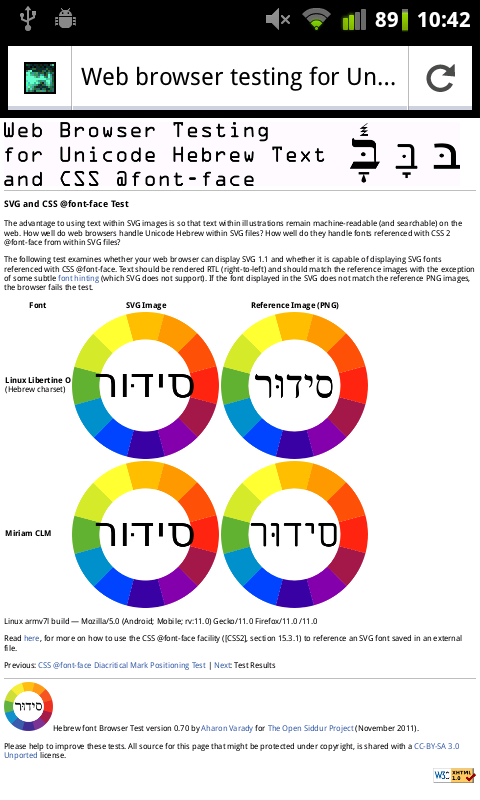 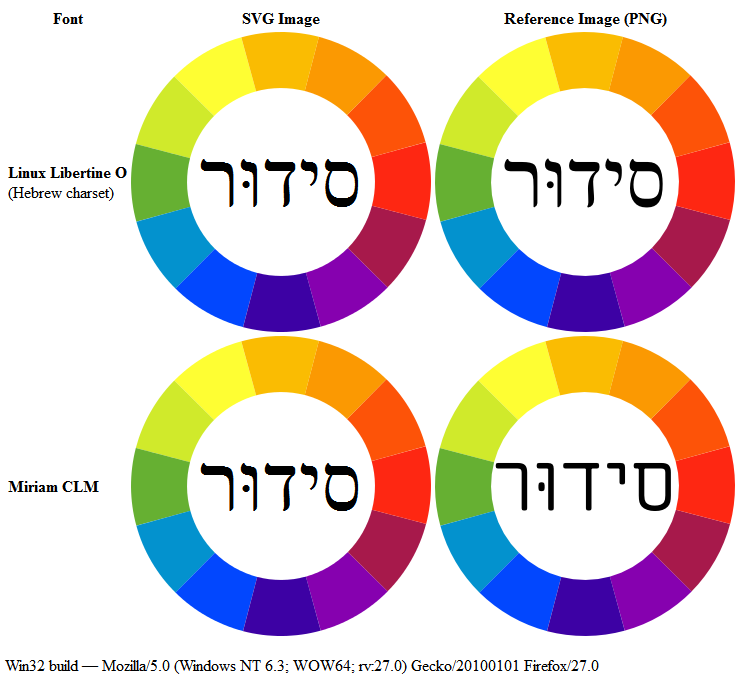 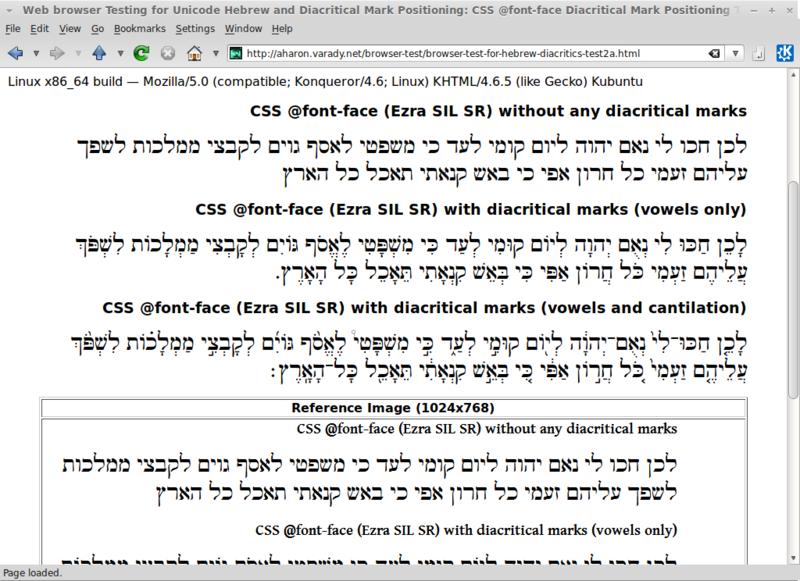 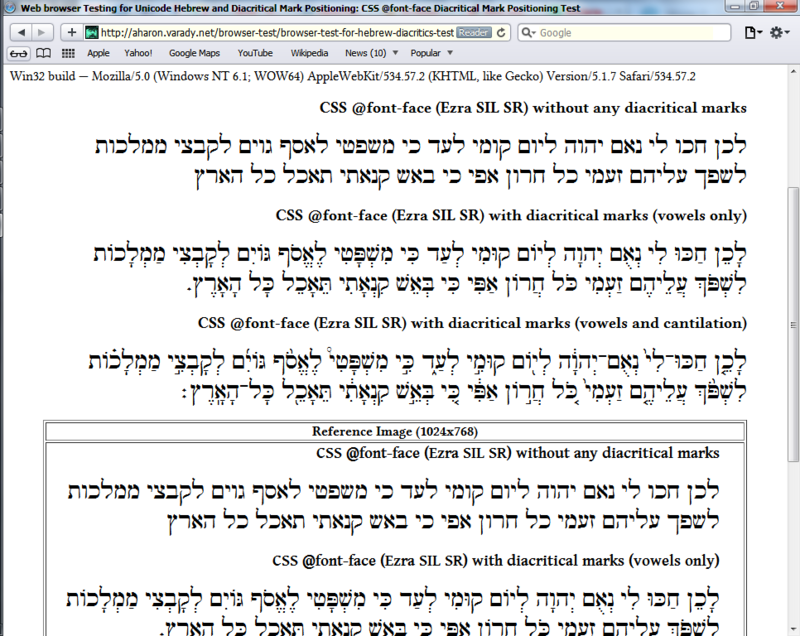 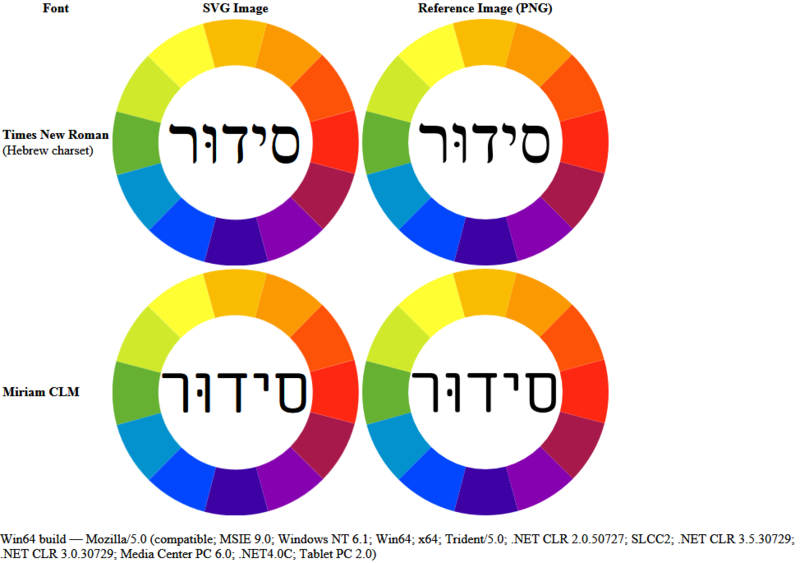 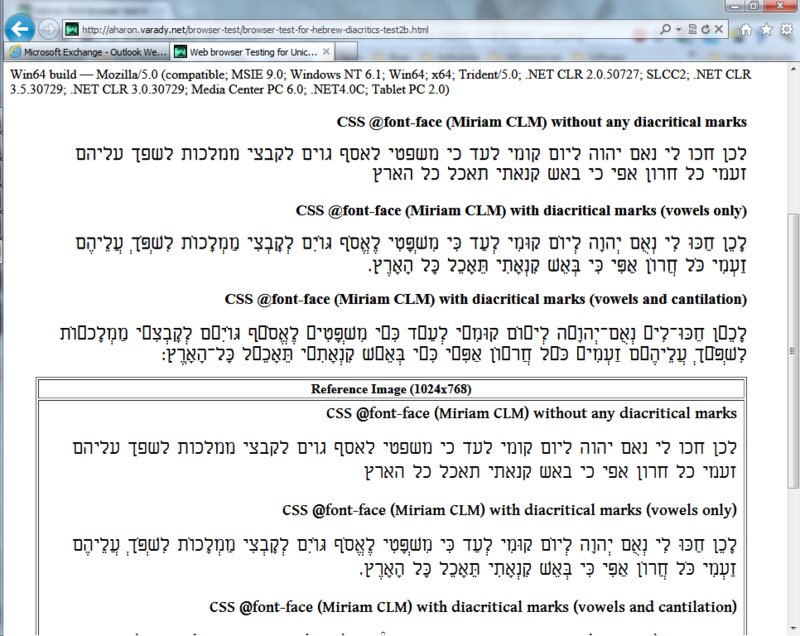 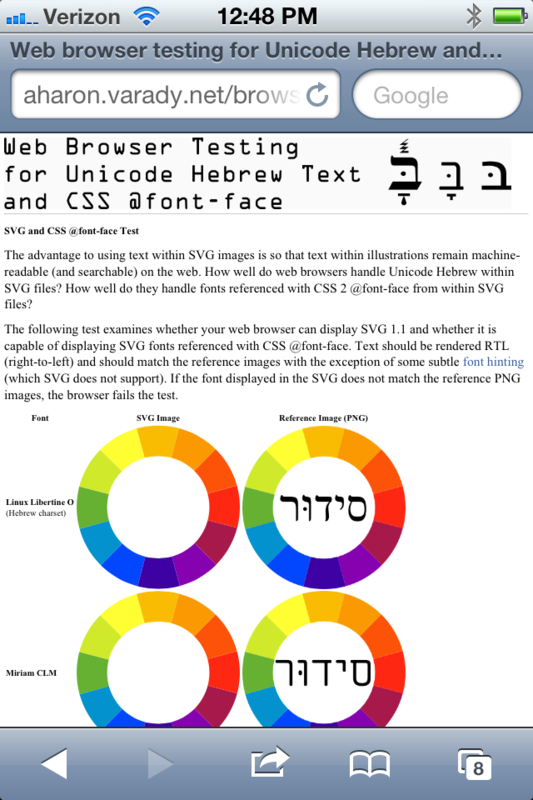 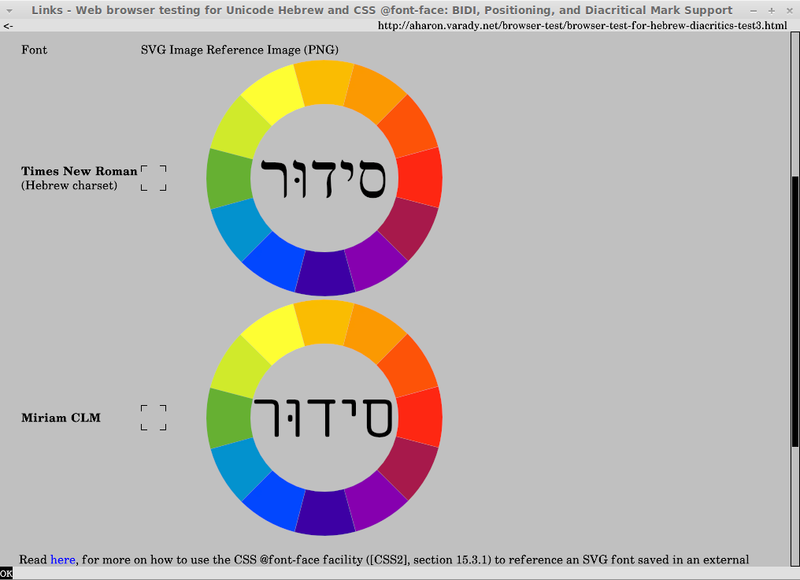 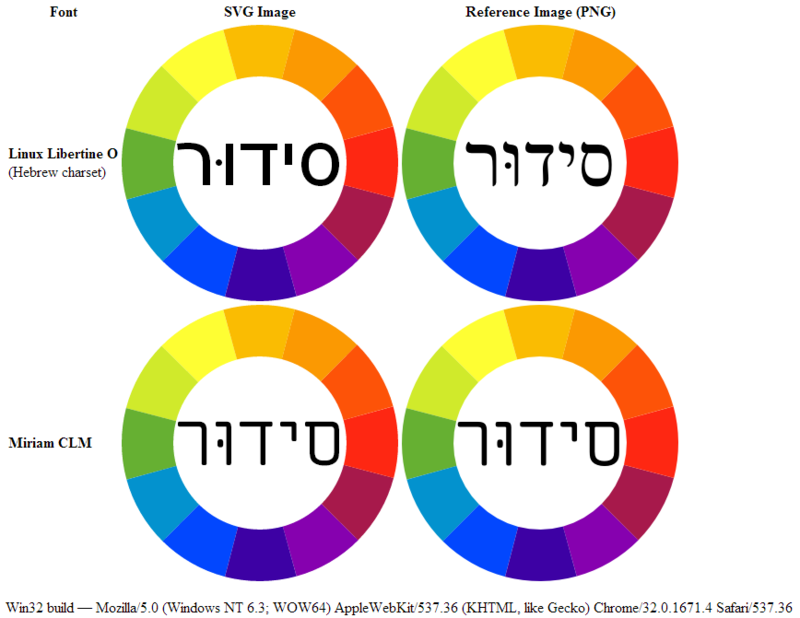 The two main differences between most modern web browsers is in how well they support CSS @font-face within SVG vector image files and how they report diacritical mark positioning errors when they render dodgy Hebrew fonts with CSS @font-face. 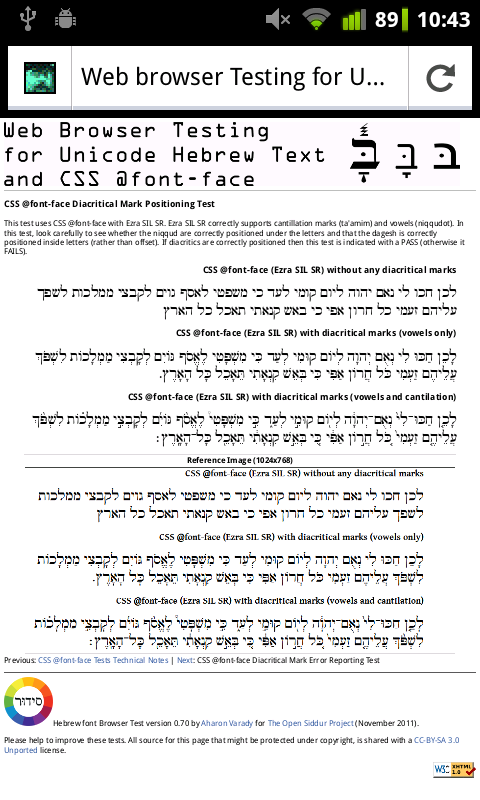 As of March 2013, only Firefox and Opera provide a simple means for selecting which default Hebrew fonts are displayed in-browser (fixed-width, sans serif, serif, etc.). 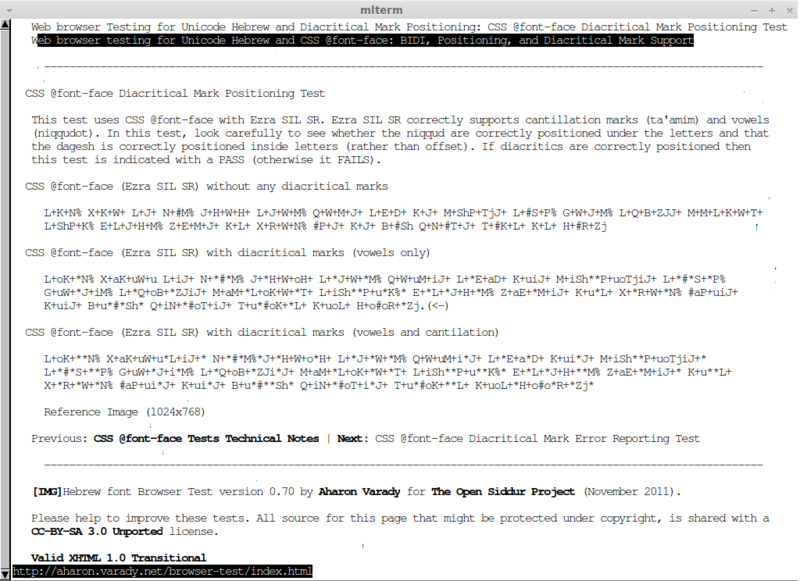 Konsole 2.6.4 Lynx 2.8.8dev7 FreeMono PASS PASS FAIL NO FAIL 2 No niqqud. 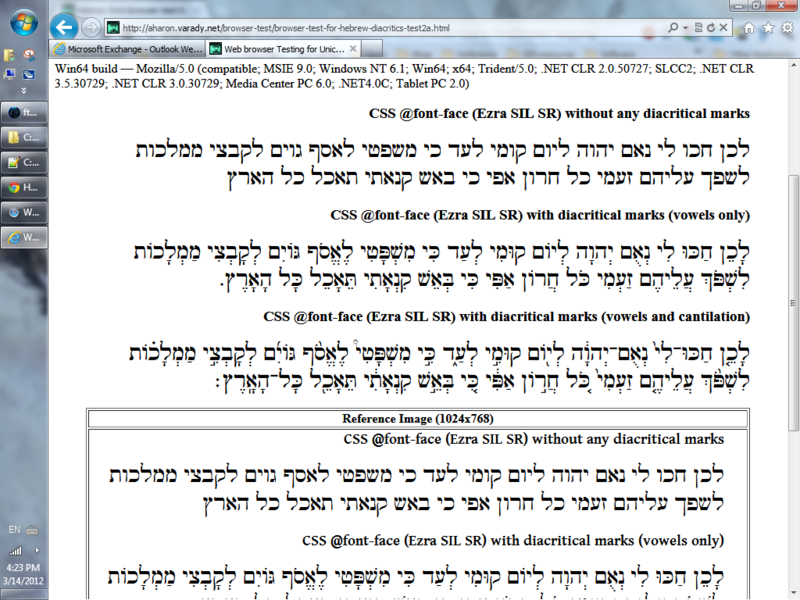 mlterm 3.0.2 w3m 0.5.2 Ezra SIL SR PASS PASS FAIL YES PASS 4 No Ta'amim. 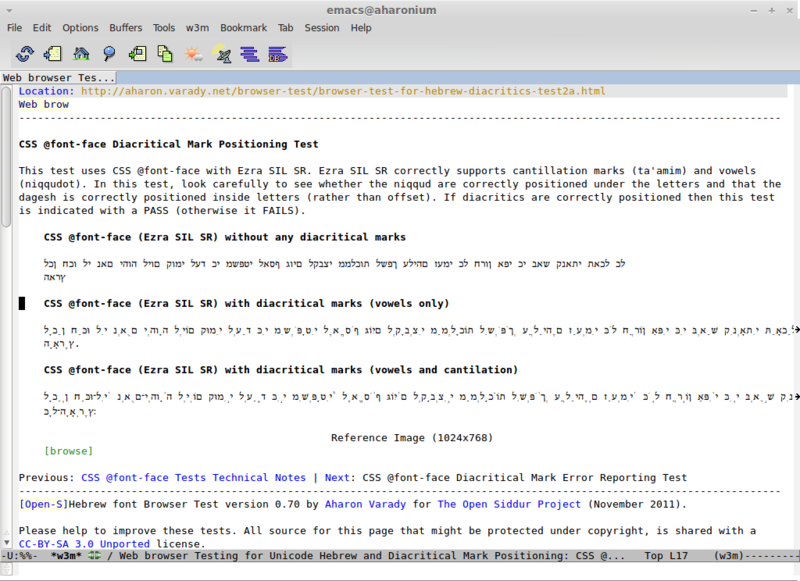 mlterm supports using variable width option. 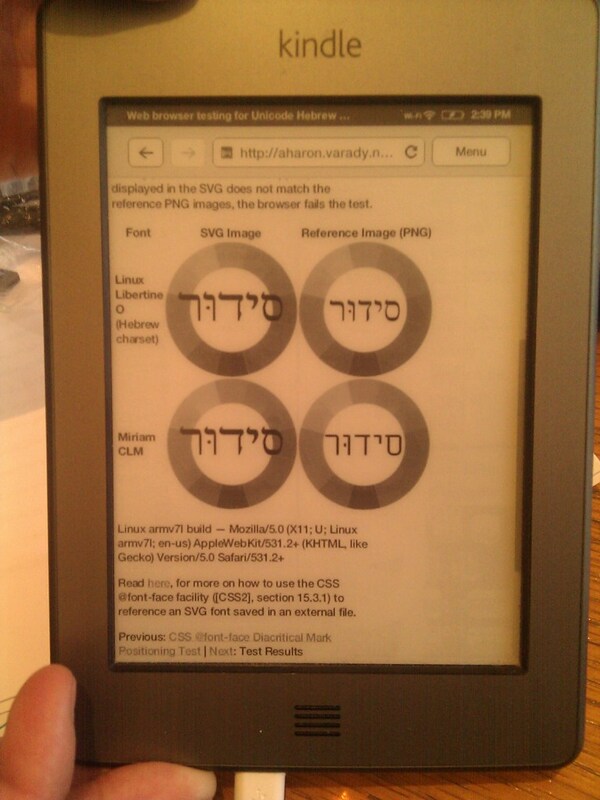 w3m-img! 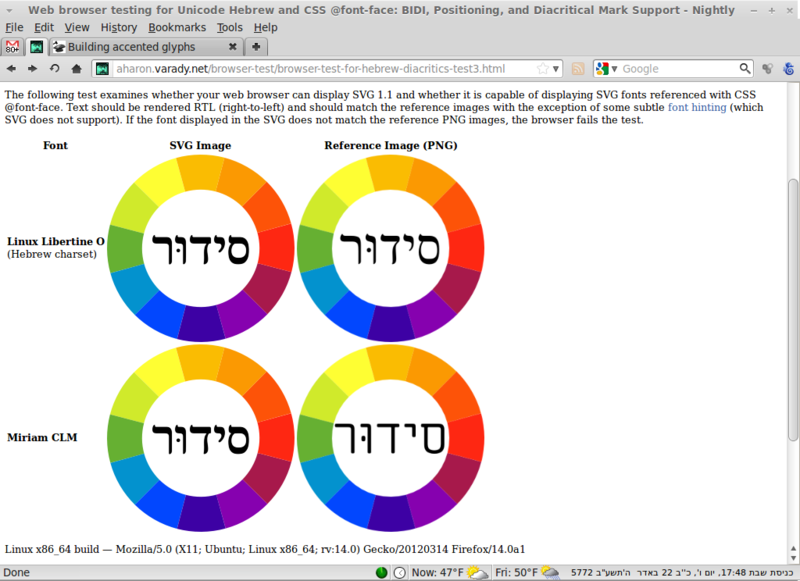 but no svg support yet. 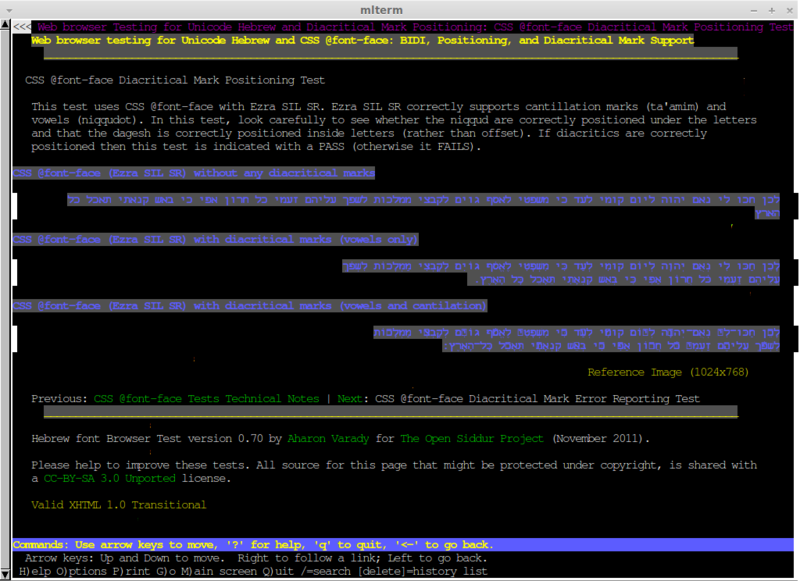 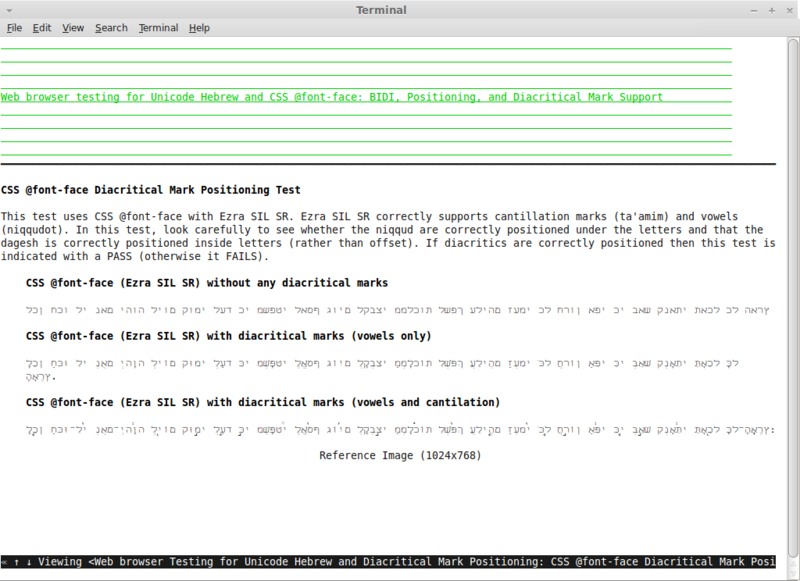 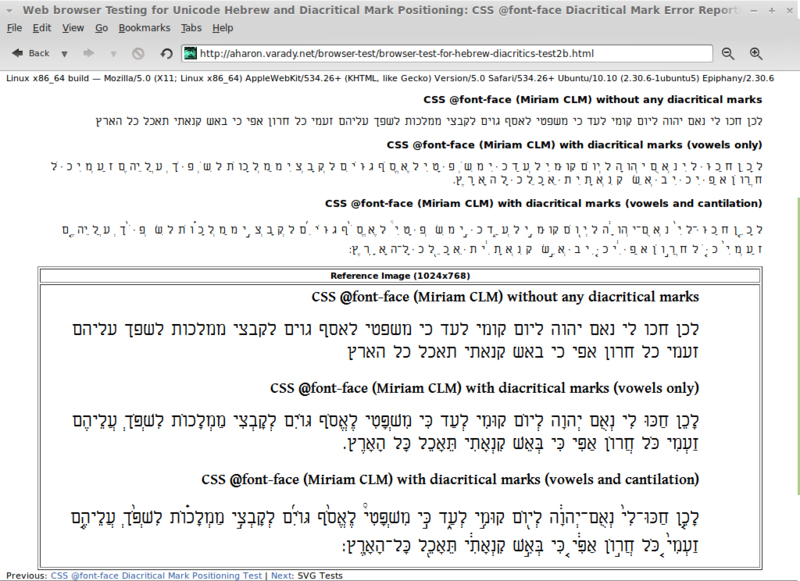 Text-based browsers Lynx and ELinks must be paired with a terminal emulator and font that supports Unicode, BIDI RTL text, and the full range of Hebrew diacritics. 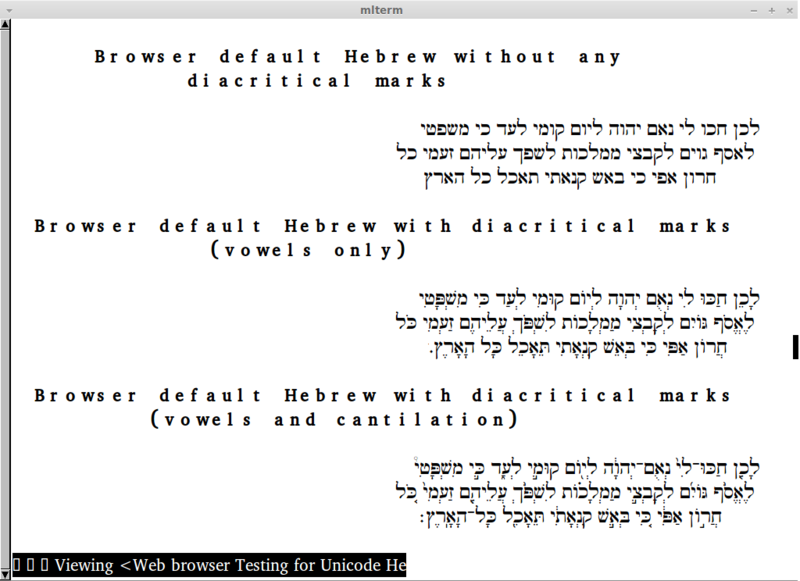 We have not yet found a terminal emulator that will display a font supporting the full range of Hebrew diacritics that also supports BIDI RTL text. 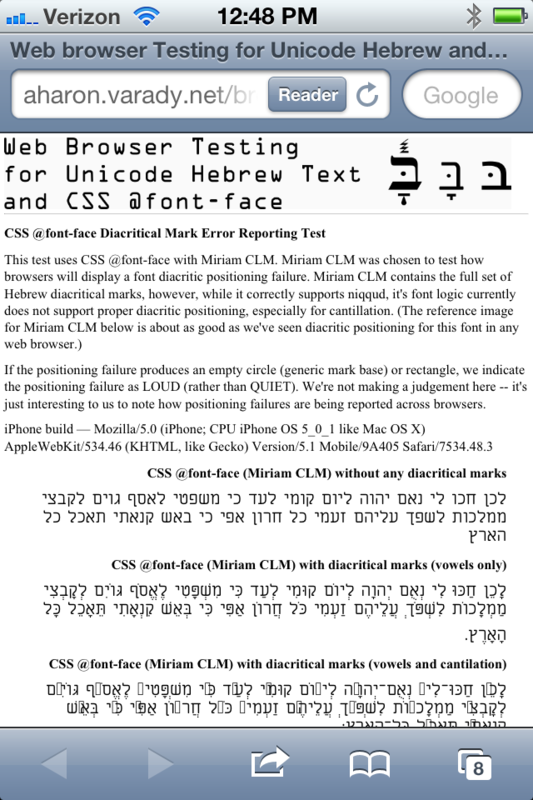 The closest is mlterm with w3m and the FreeMono font. 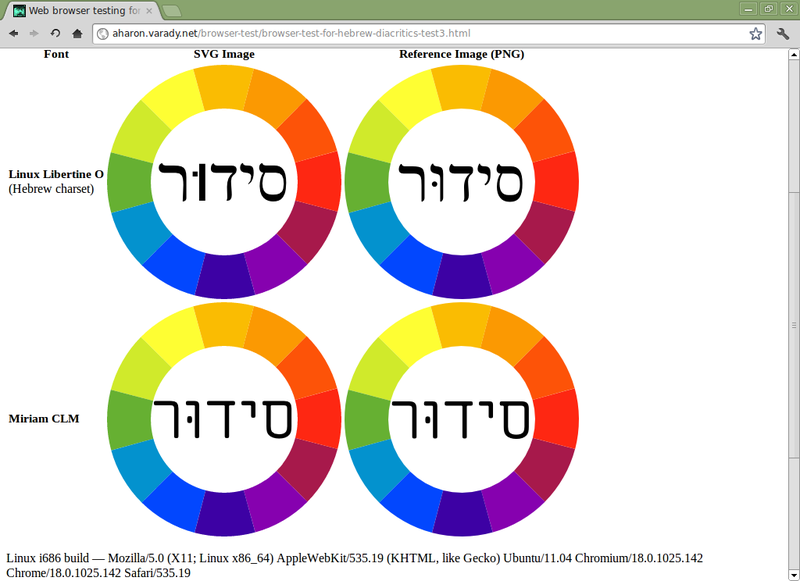 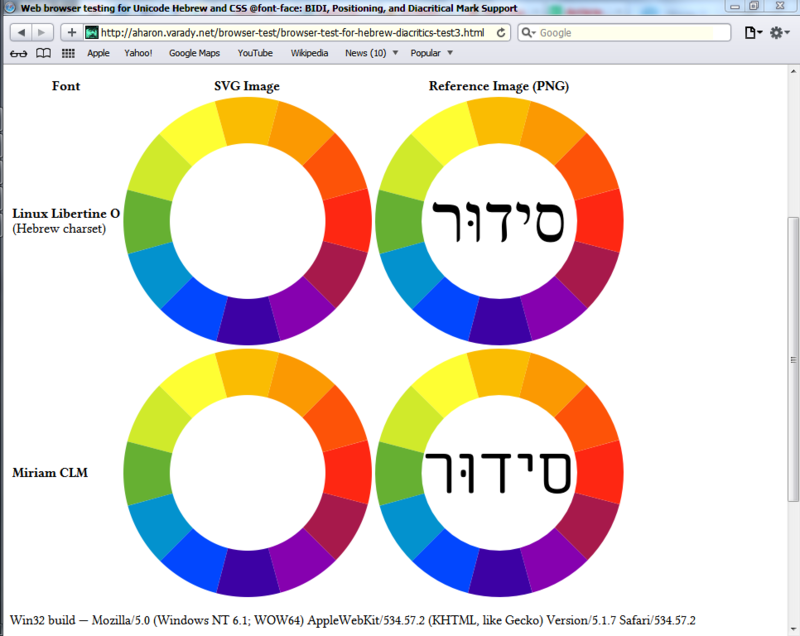 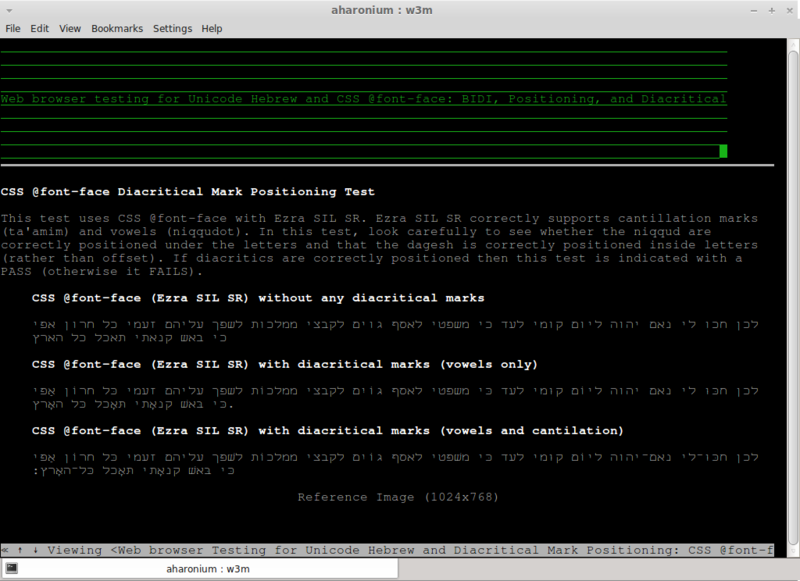 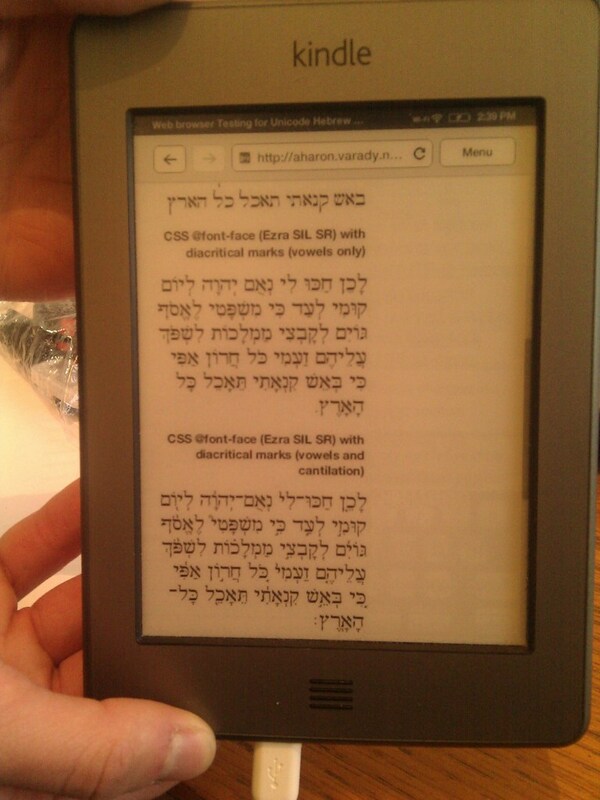 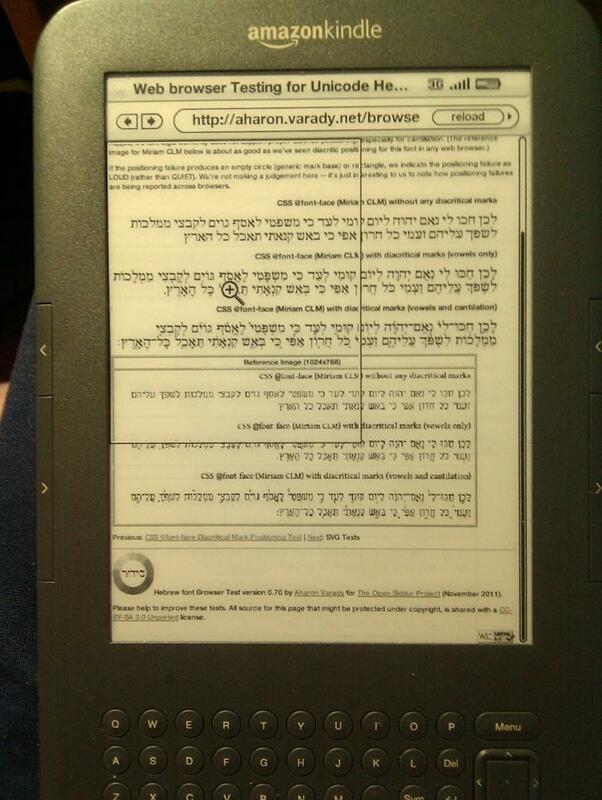 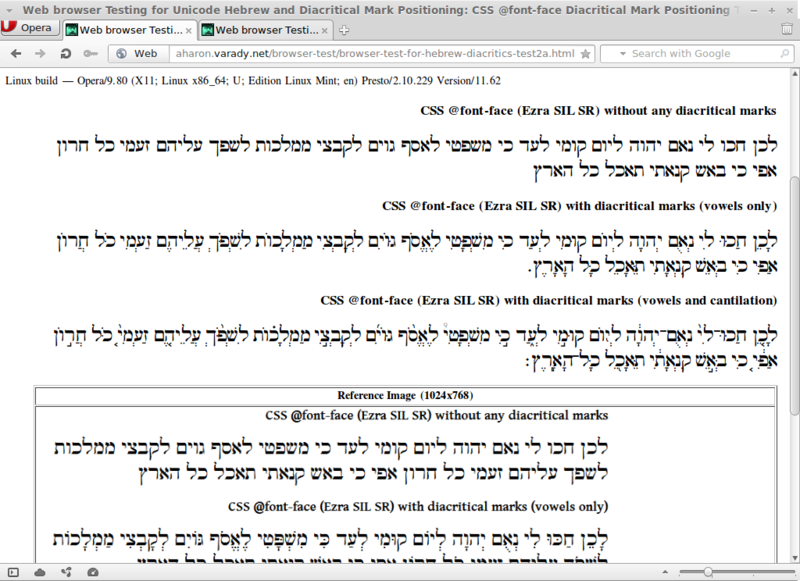 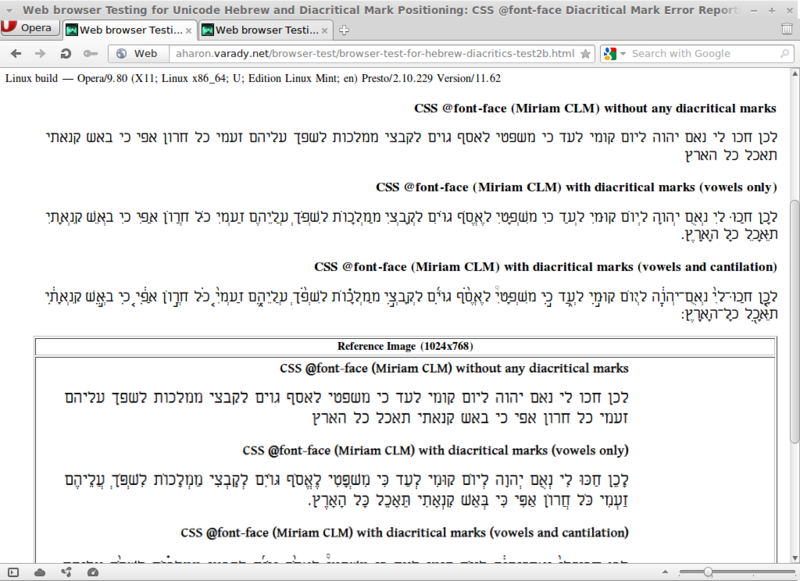 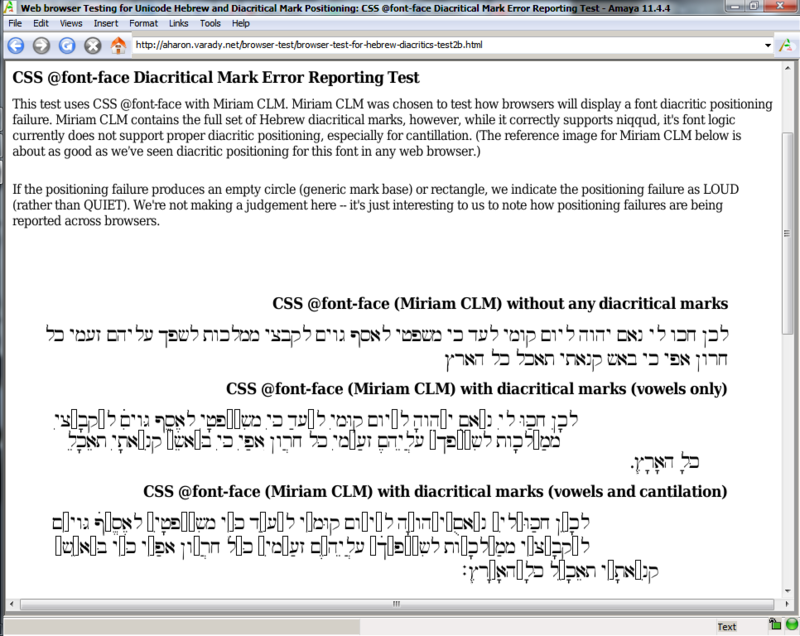 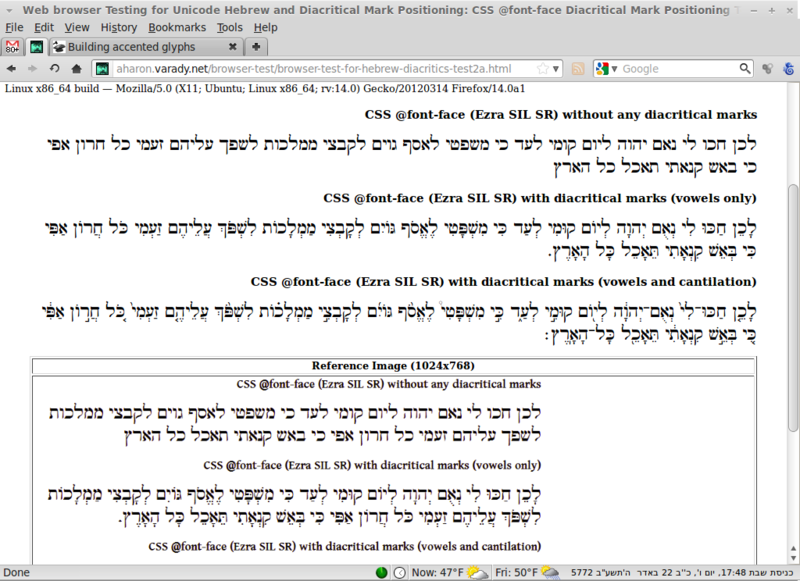 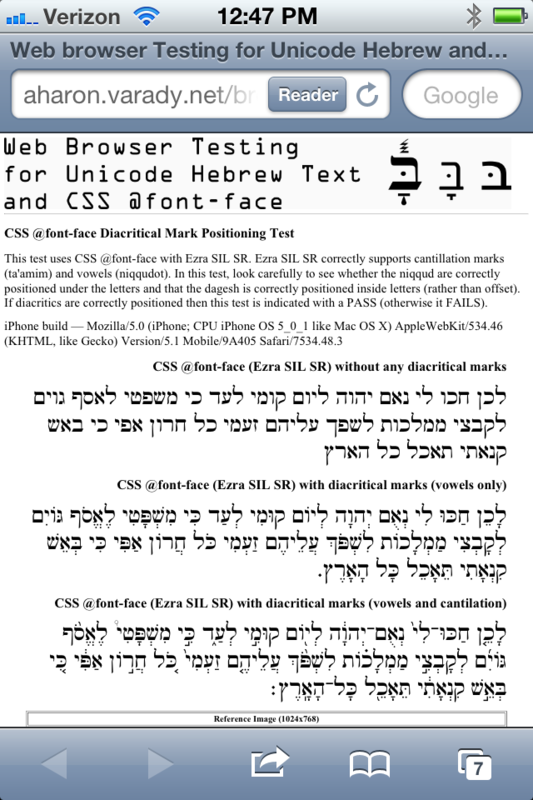 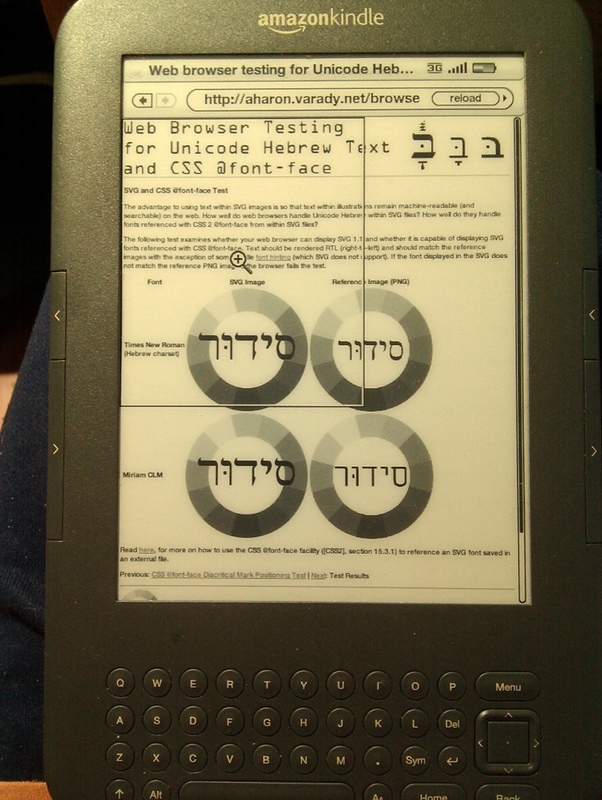 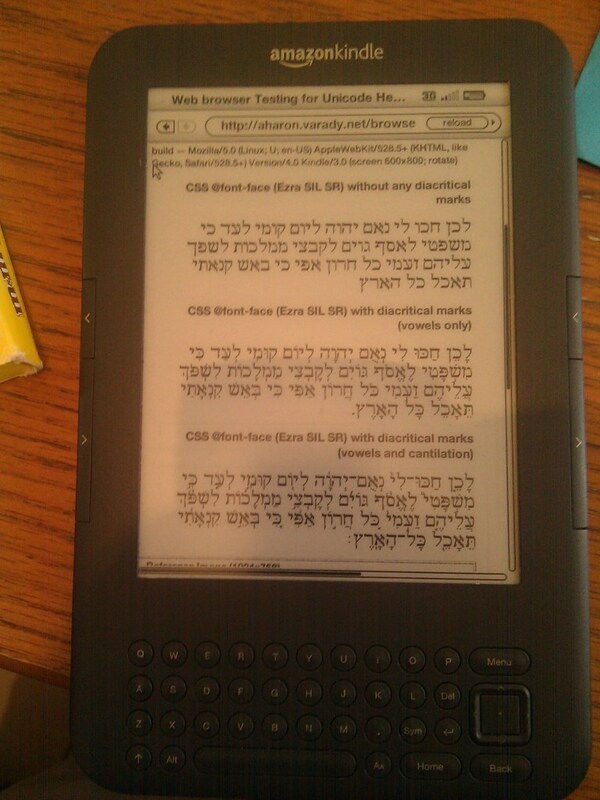 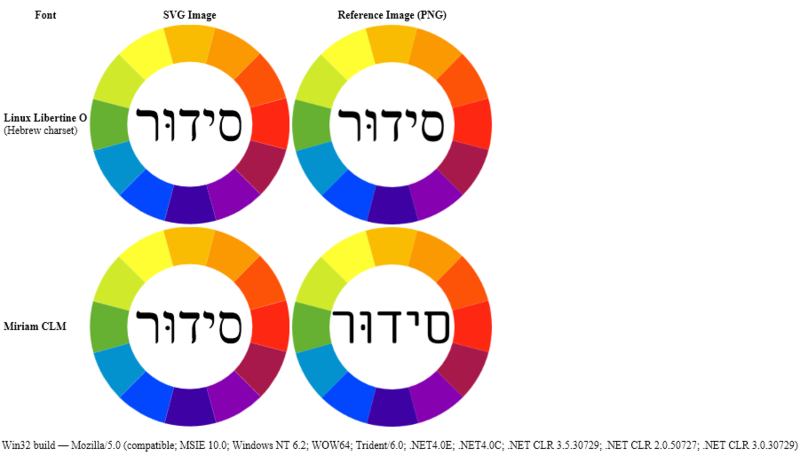 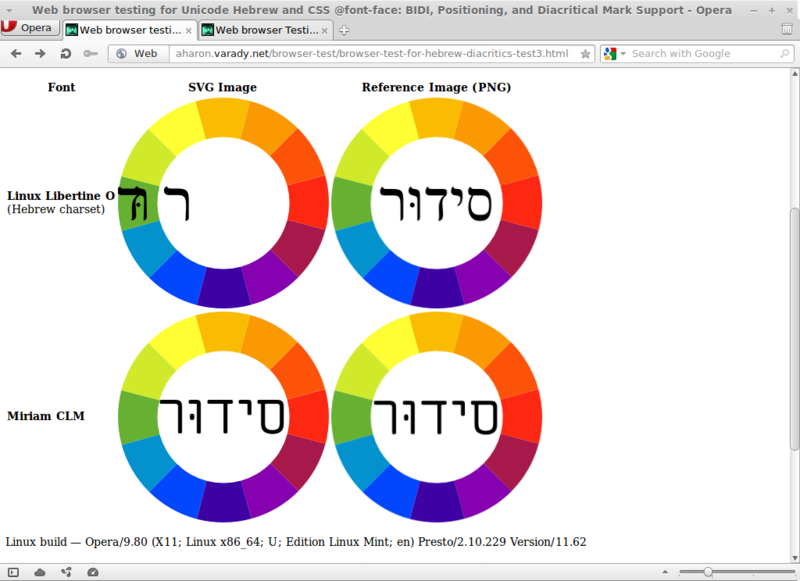 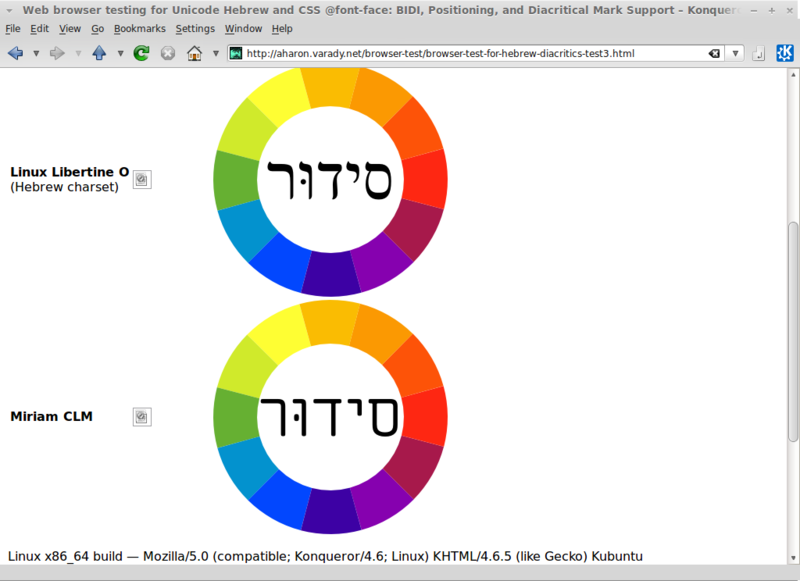 Hebrew font Browser Test version 0.70 by Aharon Varady for The Open Siddur Project (March 2012). 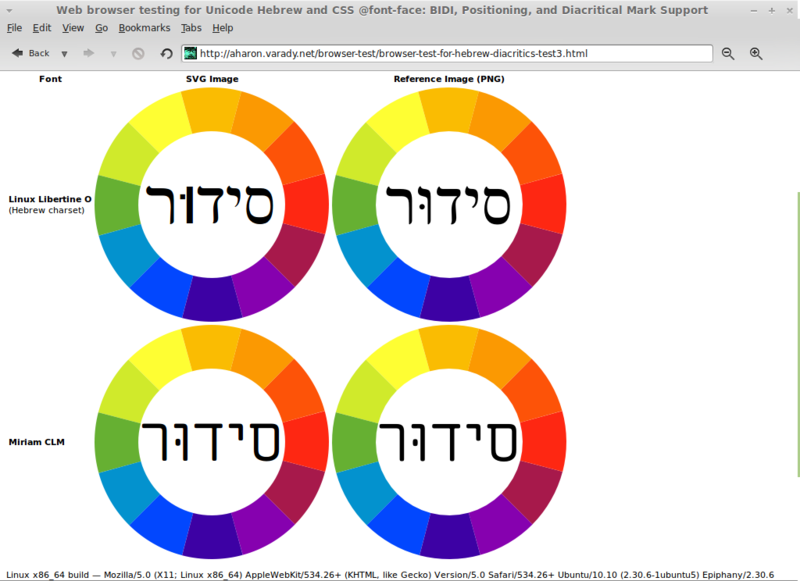 Please help to improve these tests. 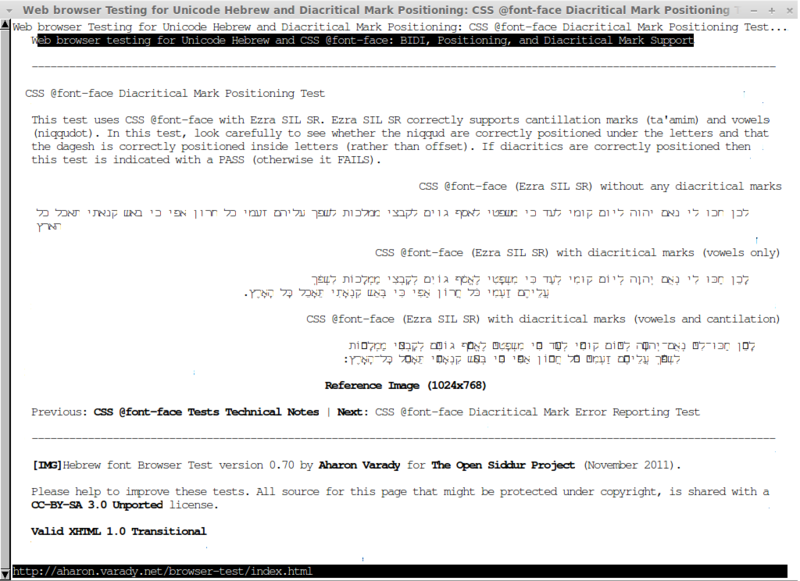 All source for this page that might be protected under copyright, is shared with a CC-BY-SA 3.0 Unported license.